The line-up for the FIFA Confederations Cup Russia 2017 is complete! 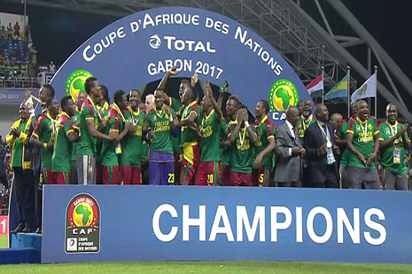 Cameroon are the eighth and final confirmed participant at the Tournament of Champions following their triumph at the 2017 CAF Africa Cup of Nations in Gabon. The Indomitable Lions came from behind to defeat Egypt 2-1 in the final in Libreville thanks to second-half goals from substitutes Nicolas N’Koulou and Vincent Aboubakar. Cameroon will join Australia, Chile, Germany, Mexico, New Zealand, Portugal and hosts Russia at the tournament, which runs from 17 June to 2 July. The competition gives each confederation’s best teams the chance at more glory on the very same stage that will host the FIFA World Cup™, the greatest footballing show on earth, one year later. Cameroon will play in Group B alongside Chile, Australia and Germany with their first match at the tournament coming against Copa America champions Chile in Moscow at the Spartak Stadium on Sunday 18 June. They will then travel up to St. Petersburg to face AFC Asian Cup winners Australia on Thursday 22 June, before wrapping up the group stage against World Cup champions Germany on Sunday 25 June in Sochi. Cameroon will aim to become the first ever African side to lift the Confederations Cup. Mexico are the only participating nation at Russia 2017 to have been crowned champions (1999).